Between the hours of eleven and midnight -- when July 4 falls on a Friday -- legend has it that three lucky people, on a dusty road in southern Illinois, will be present when the dead decide to walk once more! Along an old road near the sleepy southern Illinois town of Prairie du Rocher, the heartland's most famous phantom funeral procession is supposed to walk again this summer. The legend of the phantom funeral began in July 1889 when two women witnessed a mourning entourage of more than 40 wagons, 13 groups of soldiers and a casket rolling along the road outside of the village. Despite the size of the group, the procession made no sound. It disappeared in the direction of the small cemetery located outside of town and never returned to the ruins of the old fort from where it had come. Although they did not yet realize it, the women (and one other witness) had glimpsed what has become known as one of the most famous, enduring mysteries of the Mississippi River region. Fort de Chartres has a rich, violent and bloody history in Illinois. The first settlers in the southern portion of the state were the French. They established trading posts and settlements in places like Kaskaskia and Cahokia, near the Mississippi River, and not far from the present-day town of Prairie du Rocher, was the site of Illinois' earliest military post, Fort de Chartres. There were several different forts that stood at this site, but the first was built around 1720. The area was beginning to be settled by this time and the French were laying claim to as much land as possible. The fort became an outfitting location for further colonization. It would also play several roles in regional history, including a part in a tragic event of 1736. In that year, the commander of the fort, Pierre d'Artaugette, received orders to attack the Chickasaw Indians. He led 30 regular soldiers, 100 volunteers and a number of Indian allies downriver from Fort de Chartres. At the mouth of the Ohio River, the expedition was met by Chevalier Vincennes from the French post on the Wabash. He came with an additional 20 soldiers and a small contingent of Indians. The combined forces then marched into Chickasaw territory, only to face disaster. Vincennes, d'Artaugette and a priest named Senat were all captured by the Chickasaw and held for ransom. When none came, all of the captives were slowly roasted at the stake. In 1751, an Irish soldier of fortune named Richard MacCarty became commander of the French fort. The original fort had fallen into ruin by this time and it was his responsibility to construct a new one using slave labor and local limestone. The new fort took three years to build and cost over $1 million, an enormous expense at that time. When completed, the fort could house over 400 soldiers and it enclosed an area of more than four acres. It also boasted a powder magazine, a storehouse, a prison with four dungeons, barracks, and quarters for officers. During the construction of the fort, the men stationed here would become involved in a series of incidents that would become the French and Indian War. In 1753, a group of French explorers in Pennsylvania were attacked by a company of Virginia militia under the command of George Washington. In the fighting, the commander was killed, touching off what historians believe led to the French & Indian War. Neyon de Villiers, the second in command at Fort de Chartres asked for and received permission from MacCarty to lead an expedition against the British in retaliation for the deaths of the French explorers. He took more than 100 hand-picked men, and several hundred Indians, and started the long journey toward Pennsylvania. The troops were joined by other French forces at Fort Duquesne and they marched on Washington at Great Meadow in Pennsylvania. The Virginia troops surrendered the battle but eventually, the British would win the war. 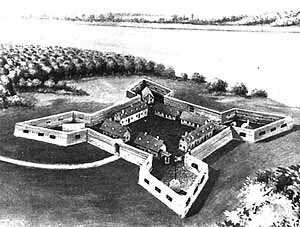 An illustration of Fort de Chartres as constructed by Richard McCarty, using slave labor. France was defeated and ceded the Illinois territory to Britain in 1763. The Indians, led by Chief Pontiac, were hostile to the new British rulers however and two years would pass before the English could take possession of Fort De Chartres. Under British command, the fort would decline and fall into ruin. Many of the French farmers and merchants migrated west across the Mississippi during the British years, abandoning the area. To make matters worse, a river flood in 1772 damaged the fort and left seven feet of water standing inside of the walls. Finally, the river channel shifted and the west wall of the structure collapsed. After this, the military garrison was transferred to Kaskaskia and Fort de Chartres was never occupied again. The original powder magazine at the fort after falling into ruin. As time wore on, the ruins fell apart and birds began nesting in the crumbling stone. The site was largely forgotten until the middle 1900's, when historic restoration efforts began. Today, the original foundations have been exposed and a few of the old buildings have been restored. Living history groups frequent the place and visitors are invited to this isolated place to learn about the earliest settlements in Illinois. But time never completely forgot about Fort de Chartres. The events of the past never died here completely and it is said that at least one of them replays itself over and over again in the form of a phantom funeral procession that has become one of the most famous haunts in southern Illinois. According to the legend, three people along the road from Fort de Chartres to a small cemetery in Prairie du Rocher will be able to witness the funeral procession between the hours of eleven and midnight, but only when July 4 falls on a Friday. The modern version of this intriguing story begins in July 1889. A woman named Mrs. Chris and her neighbor were sitting on the front porch of the Chris house near Prairie du Rocher one night. It was near midnight and the two women had escaped the heat of the house by going out into the cooler air of the porch. They talked quietly for a short time and then one of the women noticed a large group of people coming toward them on the road. She caught the attention of her friend and they both puzzled over why such a procession of people and wagons would be on the road from the old fort at such an hour. As they spoke, the wagons rolled into view, looking strange and eerie in the pale light of the moon. Behind the wagons came carriages and men and women walking along the dusty road. There was no clue as to their purpose on this night until a low wagon holding a casket came into view. It was apparently a funeral procession, Mrs. Chris thought, by why so late at night? The two women continued to watch and they counted nearly forty wagons, followed by horsemen and mourners on foot. Then, they noticed something very peculiar about the grim parade. Even though the wagon wheels seemed to pound the earth and the feet of the men and women stirred up clouds of dust, none of them made any sound at all! The entire procession was impossibly silent! The only sounds came from the rustling of the trees in the breeze and the incessant barking of the Chris family dog, which also sensed that something was not quite right with the spectral and silent procession. The barking of the dog awakened the neighbor woman's husband, who also looked out and witnessed the strange entourage on the road. He verified the women's account early the next morning and other than those three people, no one else saw the phantom funeral march. Eventually, the procession passed by and faded away into the darkness. The two women waited the entire night for the funeral to return, but they saw nothing more. What was it that they had seen, and whose funeral was being conducted? The answers would come some years later and they would learn that the procession had apparently also been seen in the past. In fact, it was a replaying of an actual event that occurred many years before. During the French occupation of Fort de Chartres, a prominent local man had gotten into a violent disagreement with one of the officers of the garrison. The two men exchanged heated words and the local merchant was accidentally killed. Unsure of how to handle the affair, the fort's commander sent a delegation to the government offices in Kaskaskia. They advised keeping the incident very quiet and ordered the local man be buried at midnight in the small cemetery that is now outside of Prairie du Rocher. There is also another story to explain the phantom funeral procession. In this version, a quarrel took place between two young officers, one British and one French, at the fort in 1765. They fought for the affections of a local girl and dueled one morning with swords. The British officer was killed and the Frenchman fled downriver to escape the authorities. The British officer was allegedly buried in secret to prevent hostilities between the two European factions in the region. While the truth behind the story has been lost, it is believed that Mrs. Chris and her neighbors were witnesses to an inexplicable event that was replayed more than a century after it first occurred. Since 1889, accounts have been sketchy as to when, or even if, the phantom procession has been seen. It is known that July 4 fell on a Friday as recently as 1986, but there is nothing to say if the procession walked or not. In 1997, July 4 once again fell on the designated day and while no one actually saw the procession (thanks to a lot of foolishness and people driving back and forth along the four mile stretch of road between the fort and the cemetery all evening), there was one odd event that took place. A staff member at the fort reported to me later that summer that on the stroke of midnight, all of the coyotes in the area began to howl in unison. It only lasted for a minute or two, but I couldn't help but think what a strange coincidence it was. Or was it? Perhaps they sensed something in the air that no animals of the two-legged variety could discern? Coincidence or not, you'll have the chance to search for the phantom funeral on your own in the future. July 4 will again fall on a Friday in the years 2008, 2014 and 2025. If you are feeling brave, take along two friends and stake out the old road that leads to Fort de Chartres. You might just be in the right place at the right time when the dead decide to walk once more! © Copyright 2004-2008 by Troy Taylor. All Rights Reserved.